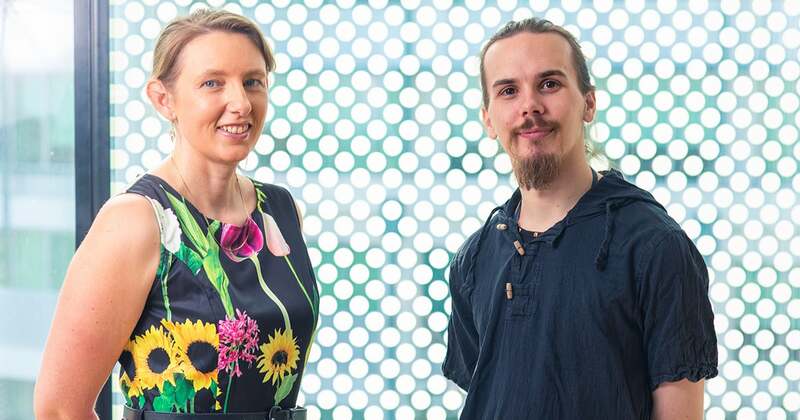 Two of Flinders University’s brightest students are preparing to embark on exciting new research after being awarded PhD Scholarships thanks to Flinders Foundation and the Volunteer Service for Flinders Medical Centre. Jessica Thomas will look to better understand cancer links with alcohol consumption, and what strategies are effective in reducing alcohol-related breast cancer risk in South Australian women. Dylan Martin hopes to increase knowledge of, and treatment responses for, breast and prostate cancers by taking an in-depth look at UGT proteins. UGTs are a critical part of the body’s detoxification system responsible for the eliminating foreign chemicals, pharmaceutical drugs and hormones, among others. The partnership between Flinders Foundation and the generous Volunteer Service for Flinders Medical Centre will provide each scholarship recipient with funding for three years to help pursue their studies. Jessica says it’s a “wonderful privilege” to receive the support. “The scholarship means a lot to me, it opens the doorway to a lifelong dream of undertaking a PhD, to learn new skills and increase my capacity to make a positive impact on health outcomes,” she says. “There is clear evidence of (alcohol-related cancer risk), however there is limited understanding of why women are drinking more and how to effect change. Meanwhile, Dylan is keen to get started in the lab. “My project seeks to gain an in depth understanding of the impact of UGTs in breast and prostate cancer by exploring their function and effect on androgen levels in cancer models grown in the lab,” he explains. “The study will focus on the effects that UGTs have on cancer growth, survival, gene expression and susceptibility to existing anti-cancer drugs, and this can then be translated into understanding the role of UGTs in cancer progression and drug-responsiveness in patients. The pair will be supervised by Flinders University’s Professor Paul Ward and Dr Robyn Meech respectively.